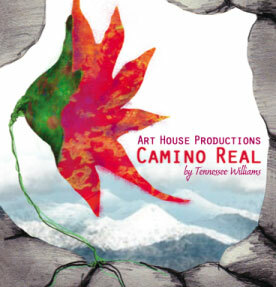 "Camino Real is a dream - one that will make you believe in the power of theater to transform the ordinary into extraordinary. Images of the play will stick with you long after the curtain has closed. This is the second Art House production for Fred Backus who plays Kilroy. His Kilroy is slightly na�ve, but it is his innocence that creates such an endearing character. Ronnie Newman gives a stellar performance as Gutman, the discriminating and cold hotel manager. Liz Douglas (Marguerite) and Chris Sena (Casanova) are magic together as two world-weary lovers clinging to each other. Maria Silverman also gives a stand out performance as the gypsy. Other cast members include: Eytan Bayme, Steve Capo, Maggie Cino, Katherine Damigos, Jason A. Drago, Carlo Fiorletta, Sarah Ashford Hart, Richard Kirkwood, Nathan Kosla, Alicia Kurzer, John Mulcahy, Juliet O'Brien, D. Pedroza, Chip Peoples, Duncan Pflaster, Roland Ramos, David Ribyat, Heather Lee Rogers, and Cem Uyanik. The crew includes: Sean Brosnan (lighting designer), Don Heineck (technical director), Annie Kessler (production associate), Janine Slaker (video designer), Maeve Sweeney (stage manager), and Jeanne Zacarias (choreographer). 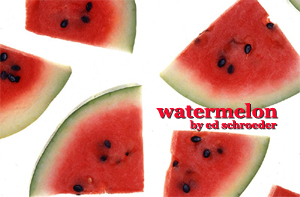 Art House Productions presents "Watermelon"
Watermelon� was written by Jersey City native Ed Schroeder as part of a larger piece �Water Is Strange�. This excerpt is a multi-media exploration of the future. Or more specifically, the unknown question of what comes next in life. The recurring theme here is one of throwing life�s baggage over your head and letting the wind �woosh it away forever�. Visually it was a treat with the use of video and eccentric choreography. Wonderful performances by David who played Ed, Katherine Damigos who played Rie and Judy Nunez and Trish Szymanski who were Rie�s �controllers�" ..what �Watermelon� had was a complete cycle. 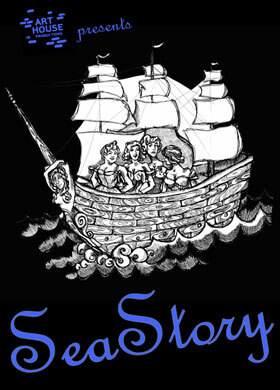 A beginning, middle and end which made it work as a one-act offering that stood on its own." ..Just as we are nearing the end of this nautical adventure, and I think Ponton or maybe Judy Nunez as a sea spirit might steal the show, Margaret (Christine Goodman) reenters, and commands some clouds, and our attention. 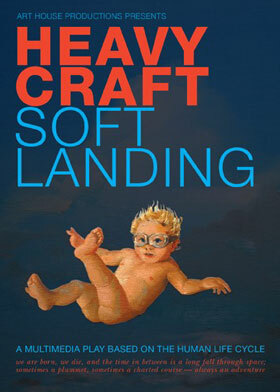 HEAVY CRAFT / SOFT LANDING -a multimedia play based on the human life cycle.